Almost done with the rivets. Just have a few rows on the underside left to do. Here's a quick pic. Sorry, but you can't see all of the rivets on the fuselage, since I didn't do another wash after finishing the last round. I've also been getting things in order so that I can get the cowl/engine properly mounted. When I put the engine in the cowl, I decided to keep the back plate in place on the rear cowl half. I'm not sure if it's supposed to be this way, or to be removed, as the instructions don't specify. However, I came to the conclusion that it would be easier to keep it there, for the sake of alignment of the engine within the cowl and then the cowl to the fuselage. 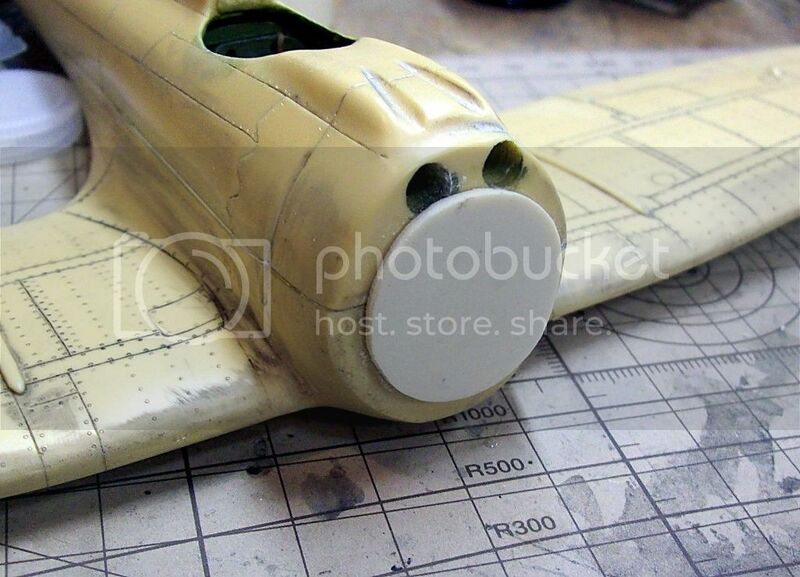 In any case, the entire assembly sits too far back on the fuselage, so I had to add a spacer that I made from resin and sanded to the proper thickness. 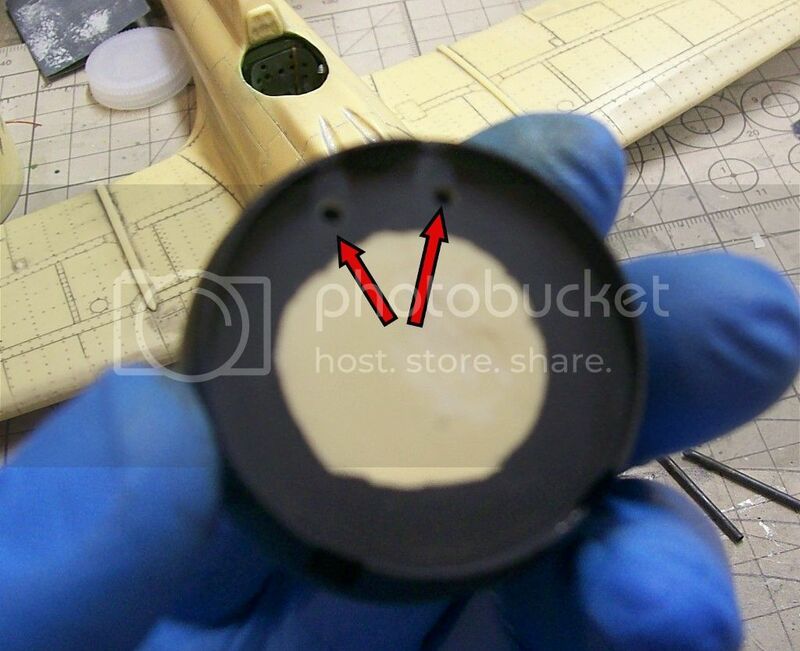 You'll also note the two large holes drilled into the forward fuselage. This was done to make more room for the guns' receivers, as accessing this area to remove material from the cockpit side was pretty much impossible. 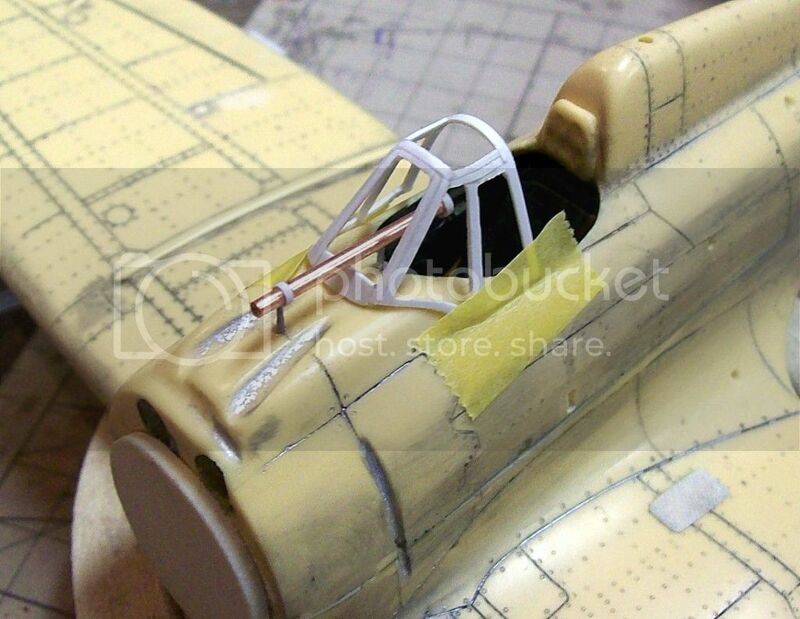 But, I figured, since the holes were there, I should stick some blast tubes for the guns in there to add just a little more detail and help busy up the area in the gap between the fuselage and cowl. I also had to drill two holes into the back plate of the cowl, aligning them with the cutouts in the front of the cowl, where the guns/tubes would protrude on either side of the top cylinder bank. For the gun tubes, I used brass tubing. 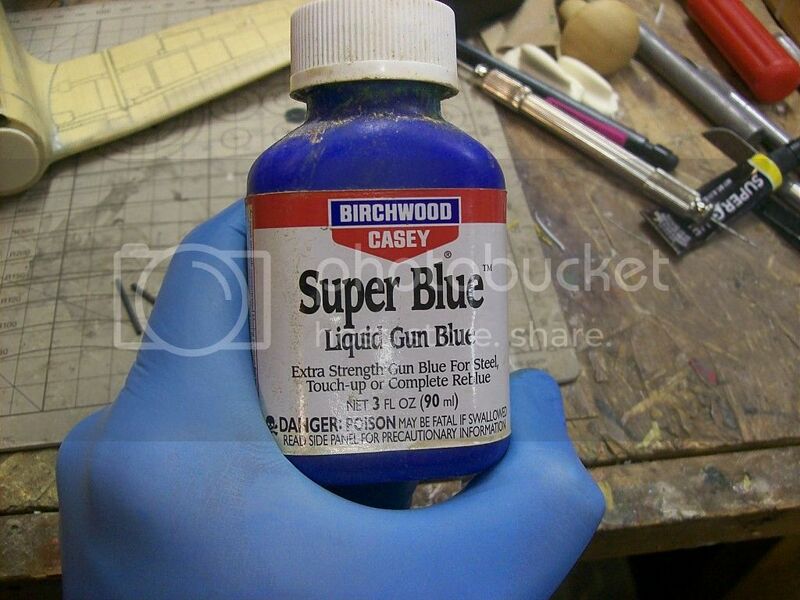 I've heard talk of products out there which are used to "blacken" metal parts, so that they look more like a blued/parkerized finished found on most guns. Being a gun collector and doing some gunsmithing of my own, I happened to have something on hand that I thought might work just as well on the brass tubes. As it turns out, it does! 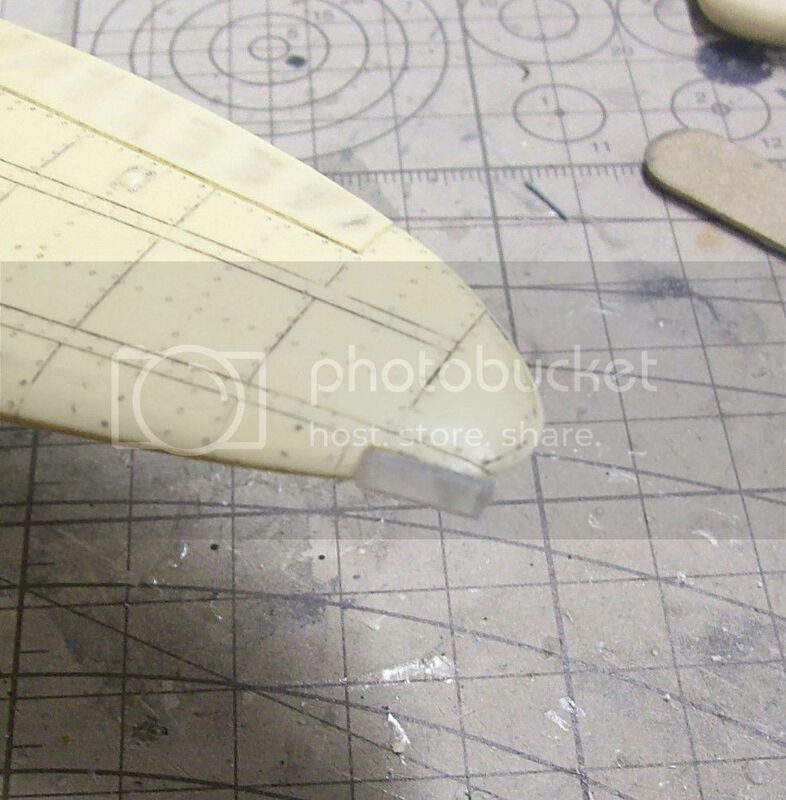 After I finish up the rivets on the bottom and add the rest of the tail parts, I need to start working on the windscreen. The kit provides a couple of vacs that have no framework. I'm going to try to make my own framing with plastic strip. We'll see how it goes. Once that's done, I think I'm ready to start painting. brilliant idea on the blueing agent! It was worth a try! I haven't priced the stuff recently, but I'm pretty sure it's well under ten dollars for enough to last a modeler a lifetime (you could reuse it for models) and can be found at most sporting goods stores and possibly even Wal Mart. I really like this build! I've got the Special Hobby one now waiting for me in the stash, but I really like your build. You're doing a great job with it. The Claude is a very good looking plane, and really represents an interesting era in plane design. Thanks for the kind words, Matt! I have the Special Hobby 2b, also. I'm not sure when I'll get to it, but have already dedicated it to be in the markings of the plane that Sakai scored with in China. I've always loved the Claude, too. It has such a "classic meets modern" vibe for me. I'm glad you're enjoying the build. I know I sure am, too. For years, I've looked at these kits in the stash and kind of dreaded starting one. But, now that work is under way, I think I'm enjoying this build more than the last couple injection molded kits I did and I know that the results will be even more rewarding. Last night I removed the landing gear spats from their casting blocks and have test fitted them. They fit like a glove and look great. Beyond that, I'm very anxious to get some paint on this bird, but I'm going to step back and slow down for a bit, first. In looking at some pics of the Russian captured Claude (probably the best close ups available), I see a couple more things that I can do to enhance things even more. 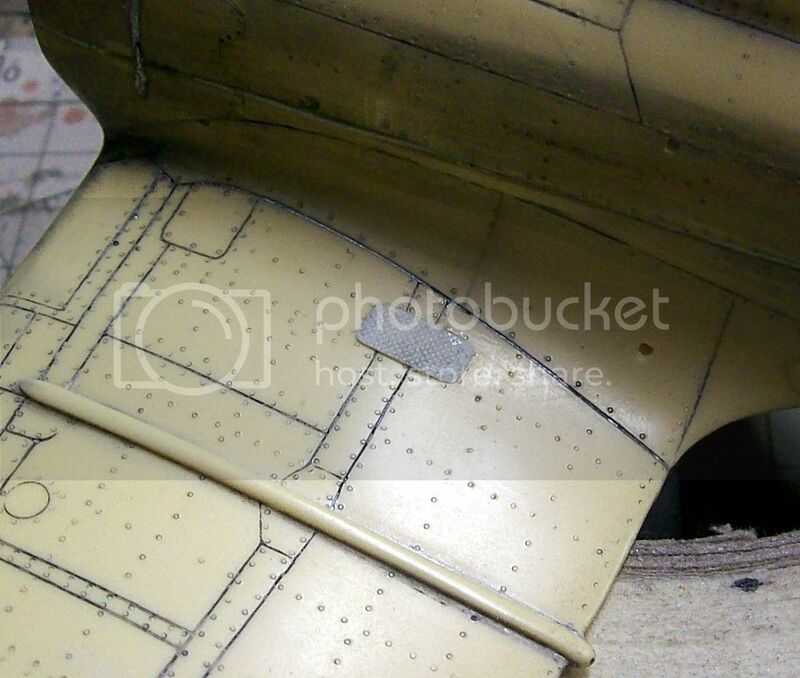 There are a couple of panel/rivet lines that I don't have and I also see that the small panel at the left wing root is actually supposed to be a raised tread-plate. I'm not quite sure how I'm going to texture it yet, but I'm sure I'll figure something out. I'm also going to spend some more time working the lights. 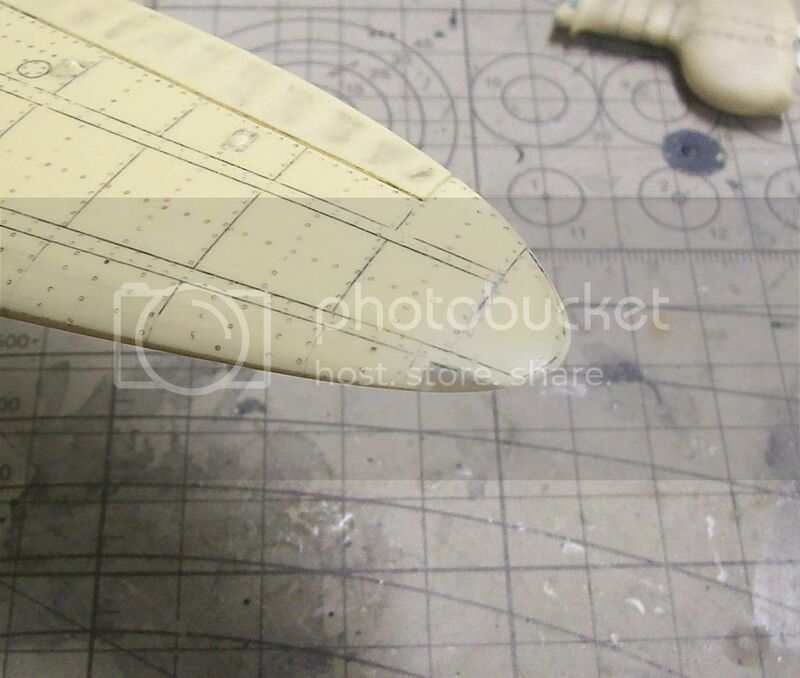 The wingtip lights that are molded into the wings will probably be filed out and replaced with built up CA, then polished. I'll probably do the same for the light at the tip of the tail. 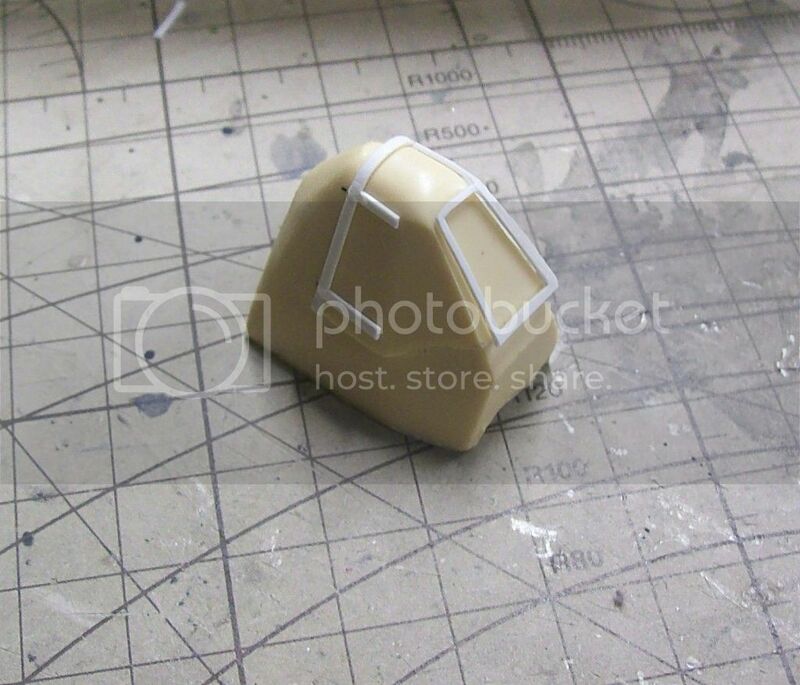 The other lights I'll probably make from clear styrene sprue. I need to work on the retractable grab handles/steps, as well. 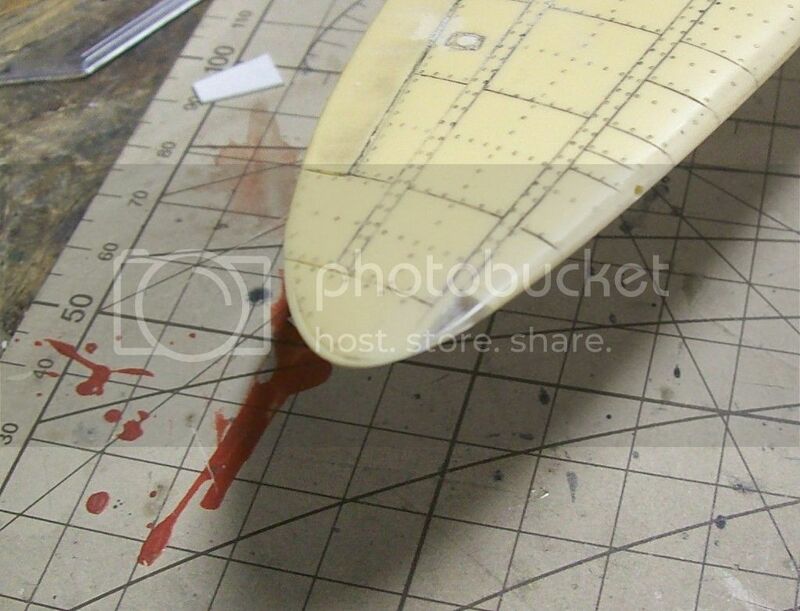 I installed the rest of the tailplane/rudder, last night, as well. 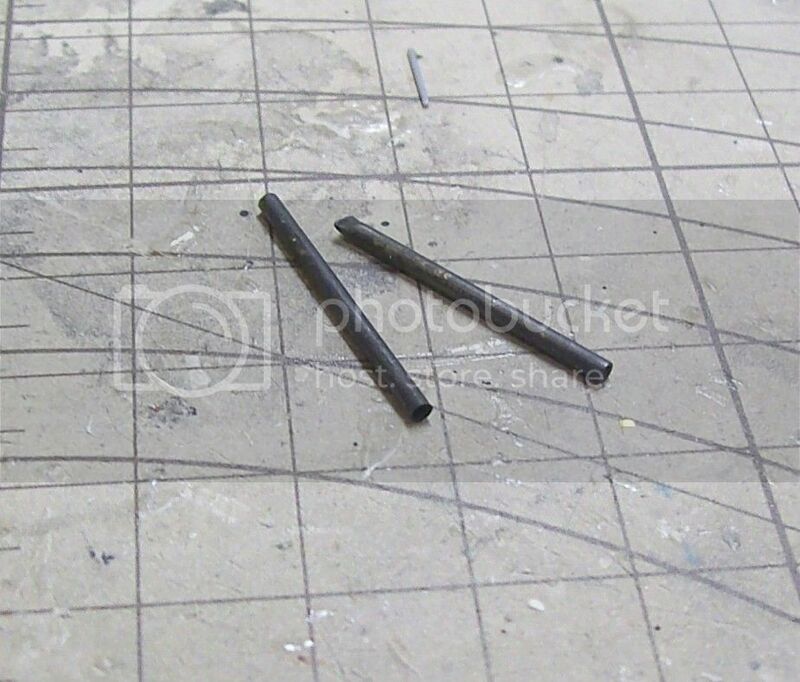 I decided to drill holes for the horizontal stabs and keyed them with brass rod for added strength. Sorry for not taking pics, but I'll probably do one more set of photos when everything is together, just before I paint. 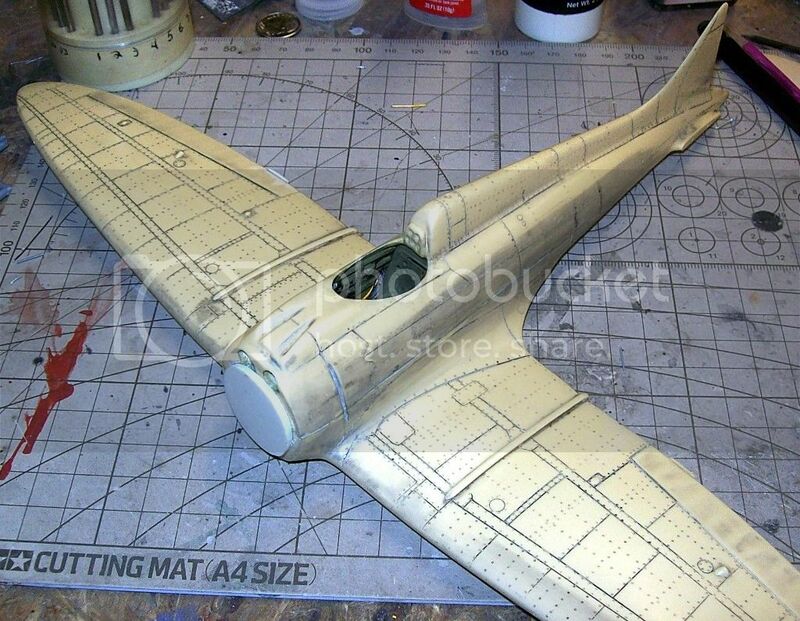 I'm also about to put the finishing touches on my P-36C build and get that officially "done", so my attention is going to be temporarily diverted. Thanks again to everyone following along and for the continued support. That's great that you finally got down to building it. I've got a couple of kits in my stash like that, where I look at them every time I look at the stash, and keep thinking I'll get to them eventually. 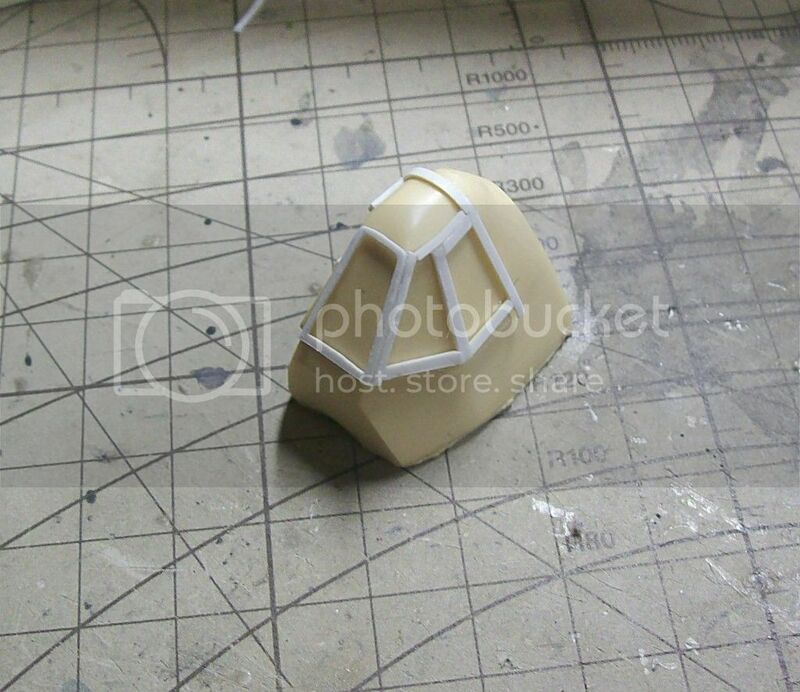 I'm probably going to use the Montex Super Mask set for some alternative schemes for the Claude. I like the red and white banded tail section, and means less chance of me screwing up the ame-iro coating on top. Please, keep up the great work. This is a fitting tribute to Dave, I'm sure he'd be happy with it. For the last few days, I've been battling an abscessed tooth. However, I've been able to do a couple things, here and there, in between waves of pain. 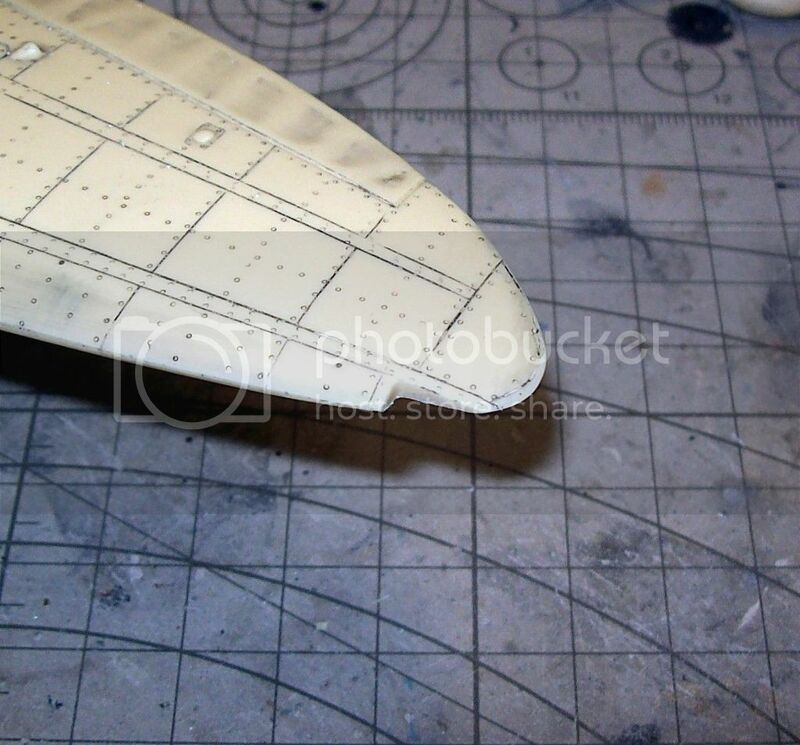 I got the rest of the rivets done and drilled out the spots for the steps and hand grabs on the port side. I still need to figure out exactly what I'm going to do for all the lights and get started on the windscreen. I think I know how I'm going to attack that, but am still not sure if I will only use an exterior frame, or if I can get an interior frame to fit, as well. I'll start with the exterior and go from there, I guess. This will be the first time I've built a windscreen/canopy frame from scratch, so it's new territory for me. Okay, my face has stopped throbbing, temporarily, so I got a few little things done. First off, here's a pic of one of the wheel spats, having been riveted. For the treadplate, I couldn't find anything in my spares boxes to really replicate it, so I took a chunk of putty and stuck it to the fender of my built 1/35 Stug III model. 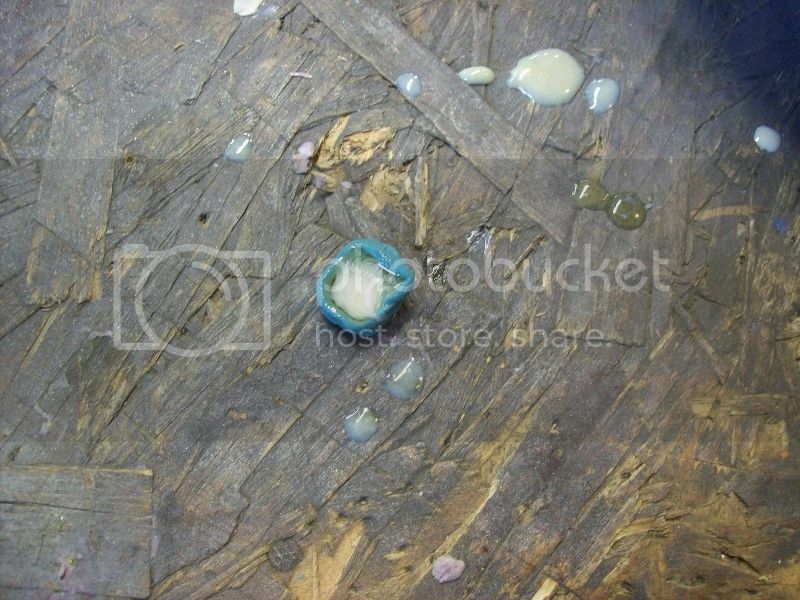 Then, I used the putty as a mold for some resin. We'll see how it turns out, as it's curing, right now. Next, I turned my attention to the wingtip lights. 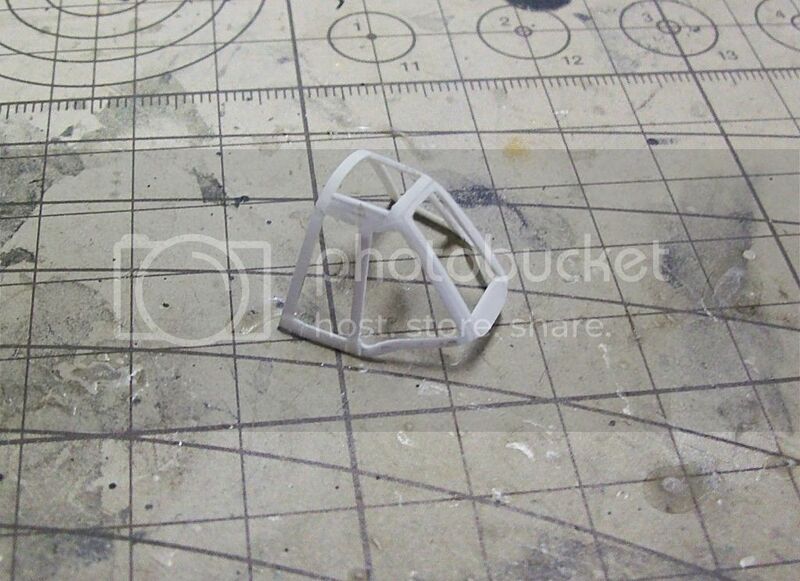 I cut out the solid, molded in lenses and used CA glue and a chunk of clear sprue. From there, I sanded it down to the contour of the wing and then polished it up with the three stage nail polishing sticks that I like so well. I will probably have to do something similar for the lights on top of the wings (two on each wing), but it's going to be more difficult to get them all the same size/shape. Also, I've got the tail cone light done, but forgot to take a pic. Oops! I'll get one tomorrow. I also figured out how I'm going to do the rest of the lights, thanks to a post by Chukw on another forum. So, they should come out better than I had anticipated. I also got my treadplate installed. I sanded it about as thin as I dared. However, looking at the pictures of the real thing, it actually stood up off the wing more than you would expect, so I think it looks good. Last night, I started working on the windscreen framing. This has been a slow, tedious process and has involved lots of colorful language along the way. I guess I should be thankful that the resin former for the windscreen was included. I can't imagine having to do this without it. 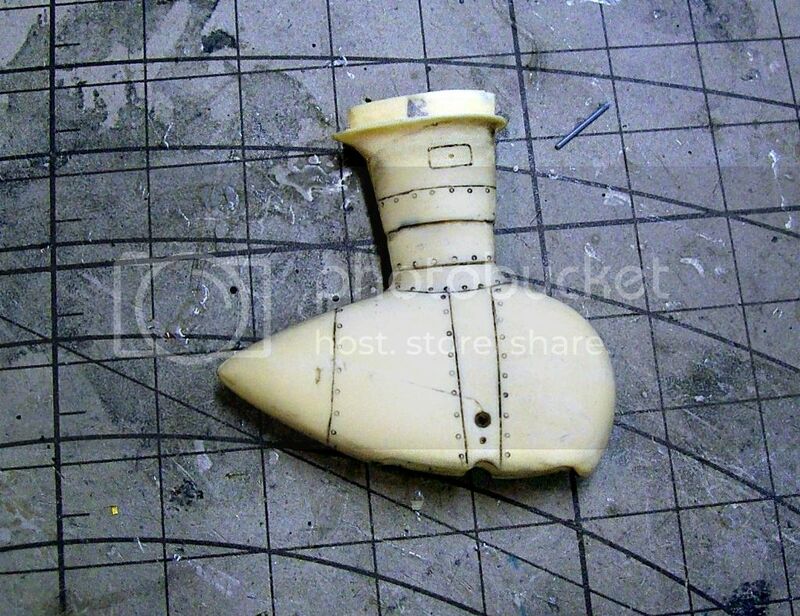 For now, I'm just getting the main parts together and trying to hit the shape as close as I can. Once everything is in place, I'll start contouring and filing things to be a closer match to the real thing. It's starting to look like a windscreen for a Claude, though! Slowly, but surely, she's getting there. I've also come to the conclusion that the kit's telescopic sight is a bit over-scale. I'm going to make a new one from metal tubing. Once that's done and I've got it's location plotted, I can get the windscreen finished up and decide on how I want to attach it. I'm pretty sure that I'm going to have to cut individual panes of "glass" and install them, as the vac parts don't really fit as tight as I would like, especially after some of the shape/dimensional mods that I've made. The struggle I'm having, is with the order in which I should do everything. The most solid way to mount the windscreen would be to do it before installing the glass, or painting it. Of course, this would make those operations difficult to impossible to accomplish, once it is installed. 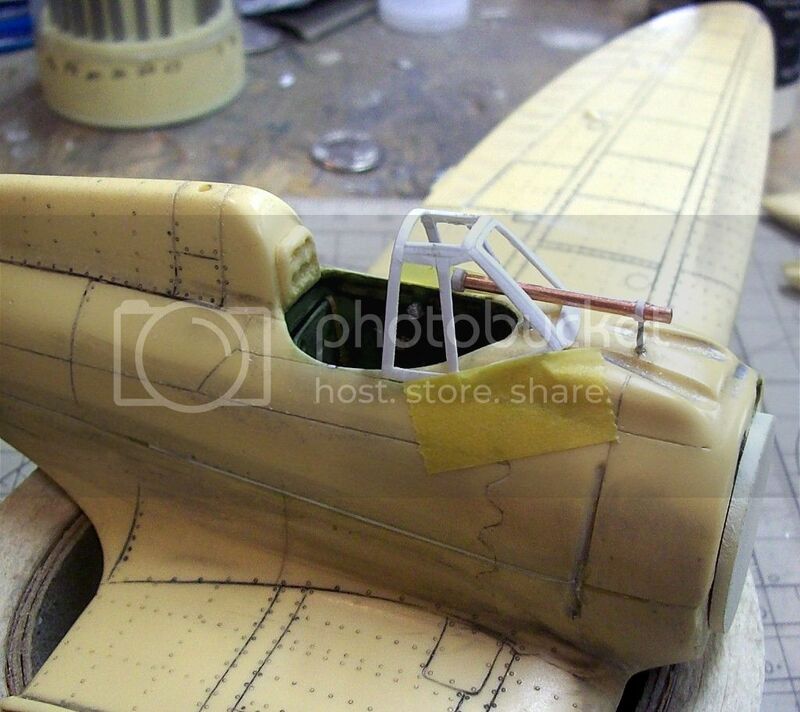 On the other hand, If I paint the interior side, install the glass, then the whole windscreen before painting all of the exterior, it could be difficult to properly mask everything off. Finally, if I put off installing the windscreen until after the rest of the exterior is painted, I have to deal with problems/flaws created while trying to install/paint it later. Decisions...decisions! Working up the telescopic sight didn't take as long as I thought it would (although, I still need to add a couple of finishing touches). So, I decided to do a mock-up to help me figure out all my angles, etc. I think I'll lower the front of the sight just a hair but, other than that, it's looking pretty good, I think.